Coach Spilakos. This framed baseball shirt is a wonderful tribute to the Easton Baseball League, its volunteers, players, coaches, and sponsors. Have an idea of something you’d like to frame? If you can think it then we can frame it. Drop it off to us at 94 Franklin St. in Quincy, MA 02169 and we’ll frame your perfect memory. Click here to see more of our projects. Often referred to as “letter” sweater in the 1950’s, this recent project at Frantic Framers belonged to a former Quincy High School student. His son came in wanting to frame this special sweater in memory of his father. Have an idea of something you’d like to frame? If you can think it then we can frame it! Drop it off to us at 94 Franklin St. in Quincy, MA 02169 and we’ll frame your perfect memory. A customer came in after recently visiting Italy to see old relatives. They came into Frantic Framers to see if we could frame this travel souvenir belonging to a great grandparent in Italy. Of course, we can! Want to see more travel souvenir projects we’ve done? Click here to see more! Have something to share? Post a picture and tag us using #FranticFramers. What would you save if you could only retrieve a few items from your home? Statistics show most people would grab at least one family photo. Our collective memories are imprinted in our brains, no doubt, but just holding an image in our hands brings forth a surge of reflective memories. Material images are a representation of all the nonmaterial things that exist within us. They offer peace of mind, and more importantly give a sense of who we are and where we come from. Framing those memories is what picture framing is all about at Frantic Framers. We have been using the motto “frame your memories” for years. During these trying economic times, we have found that more and more customers are bringing in treasured memories to frame. It’s not the signed lithograph, or original oil painting by a famous artist that are the most popular items to frame, but grandfather’s WWII medals that have been in grandma’s bureau drawer for decades that are held as the most precious. The tickets from the big game become more special when paired with photos of that special day. And memories come alive when old photographs from the past are resurrected in a perfect complimentary mat and frame. Savoring these mementos means more today than ever before. With the ever-increasing surge of technology, it makes it easier to communicate with family who live far away, but nothing can compare to filling your home with images of those you love. In the Gallery on our website, you will see examples of framed treasures. Peruse photos of our work and you will see why we are so proud to serve our customers no matter what they have to frame! As always, we look forward to preserving your milestones and memories for your homes and future generations to enjoy and cherish! 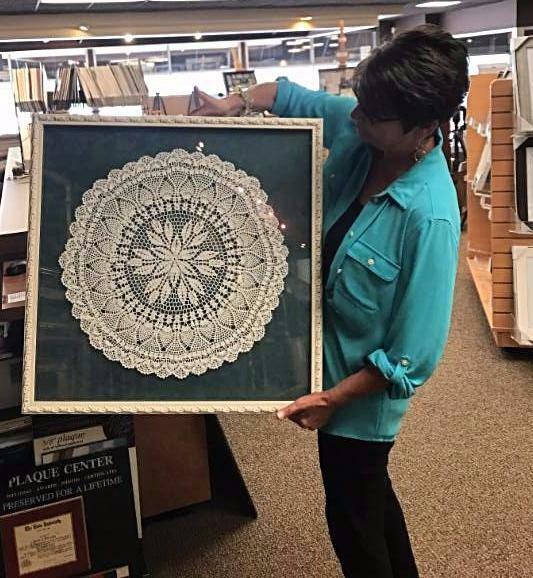 Every woman needs a “little black dress” ready for wear, but when it comes to framing, that little black frame, (which is quite often the go-to solution) can be very lackluster. The great thing about going into a custom frame shop is the opportunity to choose from such a wide variety of framing options that include literally hundreds of colors, textures, and design. The black frame is an easy choice, but it’s not always the right choice for a piece of art or photograph. There are many things that should be measured when choosing a frame. Wall color, interior furnishing, and the scale and architecture of a room should be considered. After consulting with a framer don’t be afraid to explore all the possibilities. For example, this plain black frame certainly works for this beach photograph, but another frame such as the one below could make this picture sing. The rough texture of this rock frame echoes the natural beach landscape in the image, and also creates depth. The material used is reminiscent of something one would actually find at the beach, which creates an atmosphere far beyond what a simple black frame could ever do. In 2012, the black frame comes in so many interesting finishes that the narrow simple profile will soon be an antiquated choice. A newer approach would be to forget the description “black”, and consider the “dark” frame instead. Espresso, deep brown, and charcoal gray are colors that are more in line with today’s home. Even that very first picture frame, the plain black thin metal one that hung a treasured band poster can be reinvented with a textured hammered finish metal frame, adding new dimension and visual interest. Click here to learn more about SAME DAY Framing!